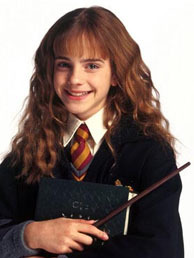 Emma Watson played the bookish, brassy Hermione Granger in the films based on J. K. Rowling's Harry Potter books. Watson's parents, both lawyers, are divorced, and she was raised by her mother. Prior to the Harry Potter films, she had only acted in school plays. Watson's drama teacher suggested that she try out for Harry Potter and the Sorcerer's Stone, some of which was filmed in Watson's home town of Oxford. Her parents kept her in the dark about her earnings from the films, until her father sat her down for "the money talk" between the release of the sixth and seventh Potter films. She says she knew she had been well-paid and that the series had been wildly successful, but that she was startled to learn the size of the payday awaiting her at her 21st birthday (reportedly about $32M). All grown up, Watson remains a major movie star, and graduated from Brown University in 2014 with a degree in English Literature. Many sources list Oxford, Oxfordshire, England. A video exists where Emma (speaking in French) gives her country of birth as France, but not any specific city. No truly authoritative source for her birth city other than this video is known to us. It is true that she spent some of her very early years in Paris. A possibility remains however, that she was born at Oxford.